Hello from Toronto, and welcome to my first instructable! I'll try to keep this as to the point as possible. I have 2 bikes, a wife and a dog. I have other things, but they're not really important. I live downtown toronto and bike 365 days a year. Last year I decided to make a new bike and pieced it together myself (not the most cost effective way to get a bike, but that's a lesson for another instructable I'll call "how to burn money and avoid telling your wife." After I made my bike I didn't even buy a lock for it as there was no way I'd leave it unattended anywhere... and living downtown and working for the man means my home is more or less the size of a shoebox. So, my options to store my bike were quite limited. If you look online to buy a bike mount, you'll quickly find that there's plenty of options out there, but they are all ridiculously priced! So I decided to use that exercise as inspiration and make my own. I learned a ton doing this project, but I am a complete novice, zero, dolt, know-nothing, inexperienced, happy-go-lucky bonehead who would rather ask for forgiveness than permission. If you're going to follow this instructable, PLEASE run your project by someone with experience and know-how. I asked my local hardware store guys specific questions geared (pun intended) to my specific needs... But I can not be sure that what I'll provide below is exhaustive or correct. There's a lot that could go wrong so please, be safe! The first thing I did was find inspiration. I've been itching to put up some pipe shelving in my unit for a while, but, as I can't even do laundry correctly (says my wife), I decided I'd start small... So when I was surfing Etsy for "Bike Mounts" and came across some examples of mounts made out of Pipes, I thought it would be a good intro! Once you have an idea of what you're looking to make, it's time to design. 2) Along the seat tube with the bike facing down. I decided to go with option 1 and measured accordingly. What I didn't do was measure the wall I'd be mounting all this stuff on. My wall is 9' X 9', I knew that... but there's a vent on one top corner and some other thing at the other corner. This came back to bite me... but I told you I'm new to all this so, lesson learned! From there, I decided to go with 3/4" black pipe and looked for the pieces I needed and dragged them into Adobe Illustrator so I could map out my design. I also added the part numbers and details to the illustrator file so I could easily find them again. The part numbers are the same between the 2 sites, but if you registered on one of them, you're not able to register on the second one with the same email address... So, you have to start again. You've been warned. I doubled my order because I was planning to mount 2 bikes (mine and the one I bought for my wife over Christmas in the desperate and ambitious hope that she'll ditch Toronto's public transit, which is costly, unreliable and simply bad). Anyway, all in, the order cost me $89.76 plus shipping, which is a fraction of the cost of what I was looking at on Etsy. I'd list the parts I picked but if you look at the image, you can see them there and then decide if that meets your needs. The pieces were delivered within a week and that process was much easier than going to your local hardware store and sifting through buckets looking for what you need. I sorted through my stuff and made sure I had everything I ordered. I then split the parts into 2 piles and went ahead and started building my first mount. Within about 8 seconds, my hands were completely filthy. So I thought it would be a good idea to fill my sink with soapy water to clean all the pipes. This worked ok to remove most of the grime, but the pipes started rusting before I could even finish cleaning them all! Like I said, I don't know what I'm doing here. Anyway, I told myself it was a cool, industrial look so just went with it. Turns out (pun intended), there are specific types of wrenches made for working with pipes! So, back to the hardware store I went to buy slipjoint pliers and a pipe wrench. While there, I also bought some tapcon screws as I'd be drilling into my condo's concrete walls. With all the tools in hand, I was able to assemble the design pretty easily! Now, here's something I don't know. I put the entire design together and then screwed it into the wall, but it would have been a hundred times easier if I could have just screwed the flange to the wall and then assembled the design from there, but I wasn't comfortable or confident doing that so just struggled through the hard way. Around this time, I realized someone stole my hammerdrill from my locker, so i had to go buy a new one. I've found that the bits that come with the tapcon screws are terrible and it's a good investment to buy a bit separately. I'm not sure if anyone feels differently, but that's my experience. Now, I'll remind you, i don't know what I'm doing. I just drilled into the wall... I asked around and everyone said it would be ok, and it was, but I had no idea if I was going to fit pipes or anything... so don't be like me, make sure! Also, when drilling, it's not a bad idea to use earplugs. Safety first! Once my holes were drilled about 3/4" past where I'd need them to be, I used compressed air to blow out any dust and then I started screwing the design in. I originally started with phillips flat tapcon screws but was having a really difficult time getting them in flush so swapped them out and used hex head screws in stead as I could use the right sized wrench and get much better leverage. I used 1/4 X 2.75 screws. Because of the position of the pipes, I found it impossible to use my drill and needed to do it by hand. The salesperson at the hardware store mentioned that removing the phillips head tapcons and replacing them might compromise the hole I'd drilled and the next screw I put in there might not be snug, so she advised me to buy some copper wire and cut them in strips and place a few in the drilled hole first, then screw the new screws in. I guess the copper is pretty malleable and secures the screw... at least that's what she told me so I did it. 1) MEASURE!!! My first attempt didn't work... I got the mount up but the bike wouldn't fit because of the vent. I got around this by swapping out one of the pipes going down for a longer one, but it was pretty discouraging. 2) GET PREPARED!!! See if you can borrow stuff rather than buy it if this is a one time project for you. I guess any "man" should have tools, but with limited room and a budget, I didn't really want to end up with more tools and less money. 3) STAY POSITIVE!!! I'm a lot of things, but "handy" is not one of them. I think this is the first thing I've ever made that worked. It was pretty fun and that fact that the alternative (etsy) was 4 times as expensive means (by my wife's logic) that I SAVED money. Thanks for reading! Please leave me some comments because I am here to learn! What should I have done differently? What should I change for next time? Let me know!! 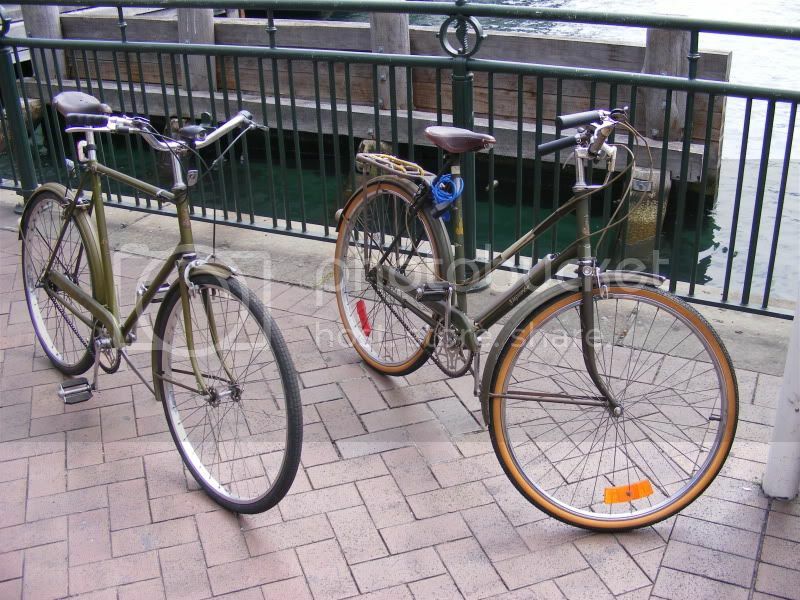 whats the difference between a male bike and a female bike? Is it the handlebars or size of the seat? I think if you just measure the bike and give it enough distance from the wall. It's actually neither of those, however I do not know if this only a European thing, but the in my country female bikes do not have a bar in the middle, or at least it's far lower down.